Line Q in New York's subway (Brighton line, Manhattan Bridge, Broadway line, 60th Street tunnel and Astoria line; all former BMT) for the various classes of subway trains. 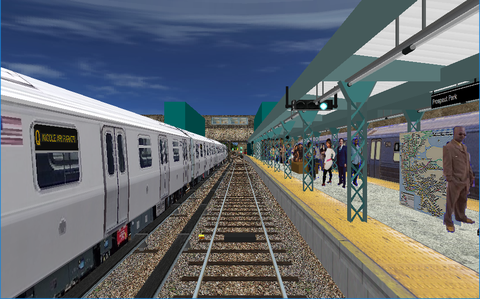 The Q line begins at Astoria-Ditmars Boulevard in Queens, goes to Manhattan and then to Brighton Beach in Brooklyn. The team behind this route provides a well-done and beautiful simulation of the highest class. Stations, trackside objects and the urban environment is detailed. Soft curves and realistic switches, announcement of stations and connections. No less than 25 alternatives for the whole or parts of the line with various train classes and time of day. There are more objects to download for this line than is mentioned on the route's download page. All archives listed in the Download from -section below are needed to get this route to display the graphics properly. The graphic object for facing switches at 57th Street, 34th Street, and some 700 m before DeKalb Avenue shows the switch in the wrong position. A trailing switch 375 m beyond DeKalb Avenue is also shown in the wrong position. *) = Any BMT Standard train is not available for OpenBVE. The R1 is a replacement to get an old subway train for the fan trip route alternative.